AND MORE CUSTOM SKUS THAN ANY OTHER DISTRIBUTOR. Pitman Creek specializes in the bass market, providing its dealers with leading edge products, hard to find special color items, and proven favorites. If you want to set your store apart by having the new items first or the hard to find products, Pitman Creek Wholesale is your source. Pitman Creek has fast delivery, great people, and the best price. We specialize in Bass, it's what we're good at...we do it every day, and we know it well. If you missed this year's show, you missed out. 175 manufacturers were in attendance represented in 81 booths. Vendors brought 20+ pro fishermen with them, including Mike Iaconelli and other big names in the industry. The Pitman Creek Cup is a FREE bass fishing tournament held for our dealers the day before our Annual Fall Show. We pair dealers with touring professionals, vendors, or PCW Staff for a day on beautiful Lake Douglas full of fish, fun, and camaraderie. 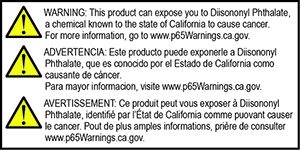 The name of the specific Proposition 65 chemical(s) that trigger the warning label. A pictogram accompanying the warning of a black exclamation point in a yellow triangle with a black outline. Another requirement is that if a product that falls under Proposition 65 is being sold online or through a catalog, the consumer must be given the Proposition 65 warning for the product they are buying.